This 1916 English Tudor Revival style mansion was selected for the 2017 Pasadena Showcase House of Design. The house was designed by architecture firm of Marston & Van Pelt for actor Samuel Hinds. 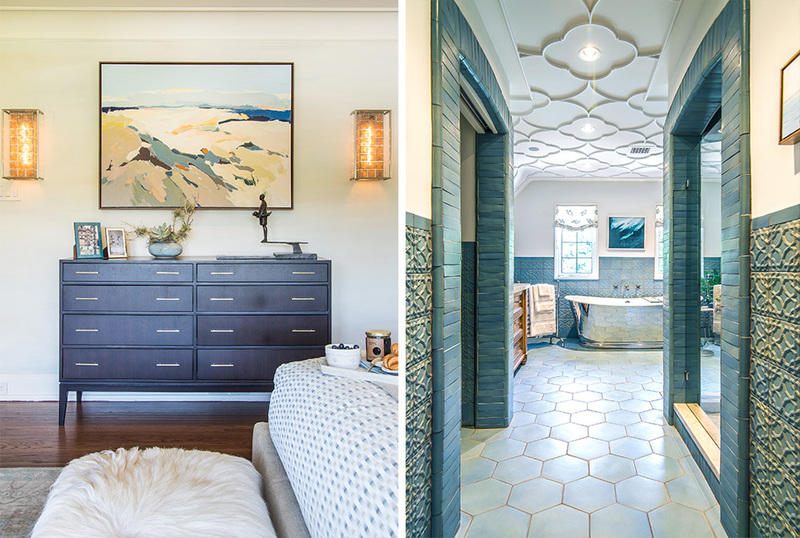 Home Front Build completely redesigned the Master Suite area using restful blues and neutrals to create “Seaside Escape”, a tranquil haven from the demands of modern life. The bathroom, sitting and closet areas were completely rearranged to provide necessary closet and bathroom space for today’s lifestyle. The luminous, watery envelope of the muted wall treatment, and sandy colored wool rug provide the perfect setting for transitional furnishings bringing freshness to the space. New tile and hearth compliment original millwork around the fireplace. A drop-down flat-screen TV offers on-demand technology at the swipe of a fingertip and completely hidden when not in use. While its configuration presented challenges, a thoughtful rearrangement of fixtures results in an enlarged, generous layout. A sculptural soaking tub offers a reference point for the generous shower, two custom vanities, and separate toilet compartment. 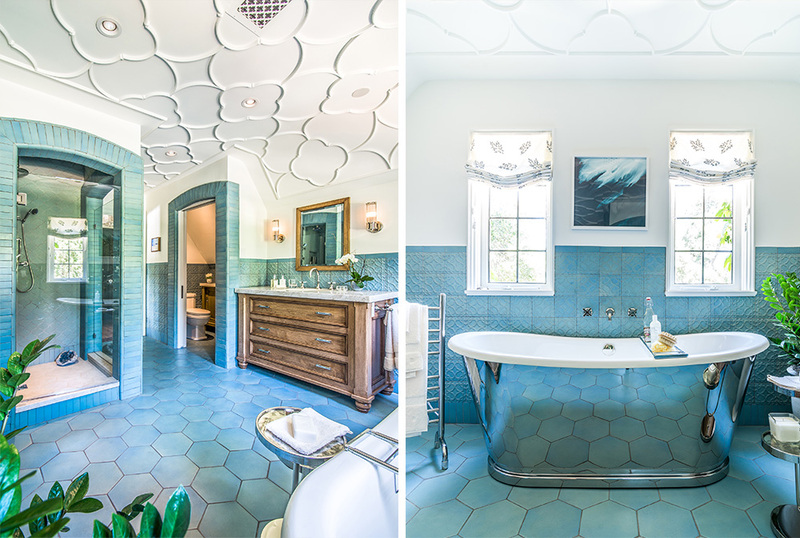 A soothing blue, richly textured tile wainscot surrounds the room in an aqueous ambiance. Old-world craftsmanship is highlighted by intricate tracery strapwork on the ceiling, offering this refreshed sanctuary a delightful connection to its historic past. Originally a sleeping porch, this space is now enrobed in the richest deep-ocean blues and serves as the Master Sitting Room. This cozy enclave, sheathed in a subtly textured wallcovering of mottled navy blues, features new hardwood flooring and a ceiling of hand-troweled integral colored plaster. Concealed speakers add to the sensual allure of this gem of a room.